What dignity did Tamils get from Sangkili to Prabhakaran? I am forwarding just this one last letter to you not because I expect a reply — you dodged me in Melbourne and also dodged my questionnaire sent to you as requested by you – but for two other reasons. First, if myths, fictions, concoctions and lies are not challenged they are accepted as the truth naturally because there is no alternative version to test and verify imagined constructions of the mind for removed from reality. Second, it is time to deal with some of the key issues that you and your leader, R. Sampanthan, have raised both at home and abroad ever since the fall of the Vaddukoddai Resolution (May 1976) at Nandikadal (May 2009). This necessitates an inquiry into the alleged accusations which are promoted as the revised line of attack on GOSL to extract more concessions — i.e, 13 + and all that — for the Tamil separatist lobby to advance to the next step on the road to Eelam. You seem to have run out of steam on the usual litany of “grievances”, “aspirations” etc and now latched on to “dignity, equality, justice and self-respect”. Well, as you know, any inquiry into these accusations must begin with the status accorded to the Jaffnaites in the history of Jaffna. That is the first base which can reveal how much “dignity, equality, justice and self-respect” were given to the average Jaffnaite by the ruling elites of Jaffna in all its phases. In the history of Jaffna adumbrated by me earlier I divided the history of Jaffna into three main periods: 1. the pre-colonial period; 2. the colonial period in which the Vellahla elite were the dominant casteist sub-rulers with total religio-social control over the daily lives of the Jaffnaites and 3. the post-independence period dominated by the federalist/separatist agents (hereinafter, the “Vaddukoddians”) which includes Velupillai Prabhakaran, the inhuman genie that came out of the Vaddukoddai bottle of 1976. The inseparable affinity between the Vaddukoddians and Prabhakaranists is sealed by the fact that Prabhakaranists base their ideology on the Vaddukoddai Resolution and the Vaddukoddians hail Prabhakaran as their iconic leader even after Nandikadal. Now my question to you is simply this: in which of the three period/s did the Jaffnaites enjoy dignity, equality, justice and self-respect in the peninsula/north where the Vaddukoddians hope to set up a federal/separate state? The scattered evidence of the history of Jaffna — starting from Yalpana Vaipava Malai and ending in the reports of the University Teachers for Human Rights (UTHR) (Jaffna) which documented most of the last phase of the rule of Prabhakaran — confirm that at no time in the recorded history of Jaffna did the average Jaffanites enjoy dignity, equality, justice and self-respect to make them feel that they belong to the human race, let alone Tamils. Tamils have a history of treating their own people as outcasts who should be kept far apart as possible without even coming within their range of sight. Some were treated as subhumans. Why? Was it because she found justice and dignity in the “Sinhala State” and not in Tamil Eelam, eh Mr. Sumanthiran?You both are lawyers and you should be the most competent Tamils in the profession to speak of the legal system of your “Liberator/Saviour”. How many cases did you and Sampanthan initiate in Prabhakaran’s courts to rescue the Tamil dissidents, or the children dragged forcibly to fill his depleted cadres, or those imprisoned in barbed wire cages in which they had space only to sit and not move one inch in any direction? Didn’t you both go along merrily with the oppressive cruelties of the day like your legal predecessors before? Your lawyers, from Sir Ponnambalam Ramanathan downwards, were the defenders of the most reactionary, oppressive, unjust status quo in the North. Your lawyers never spoke for the oppressed people of Jaffna. Your lawyers appeared in court to defend the rights and privileges of the Vellahlas to prevent the average Jaffnaite even to bury their dead according to their cherished traditional rites. The best of your lawyers never stood up in Parliament or courts to defend the rights of the Jaffnaites to enter a temple, go to a school or sit in a bus. Is that the dignity, equality, justice and self-respect you gave your own people? If you both were decent and honest shouldn’t you have jointly told this to foreign governments before levelling accusations against the GOSL about denying justice and dignity to Tamils so that they could have a balanced view of who denied what to whom? Down the ages the average Jaffnaite never got the justice he deserved because the ruling Tamil elite ganged up against the “asangha” (the outsiders). The written record reveals that your history is seeped in the blood of the Tamil victims of ruthless Tamil victimisers at the top. Your political culture denied the basic rights of Tamils to live as human beings. Ironically, you turn round and accuse the GOSL of doing things to Tamils which you have done to your own people from the time you settled down in the northern tip. As you know — and you cannot deny this — if the Jaffnaite got any justice, either in courts or in the administration it was in the courts of “the Sinhala State” and in the Sinhala administration, despite all their shortcomings. That is why you were a lawyer practising in the courts of the “Sinhala State” and not in Prabhakaran’s courts, isn’t it Mr. Sumanthiran? For instance, when C. Suntheralingam, the caste fanatic slapped a low-caste man, the government of the day had to get down a Muslim judge to preside over the proceedings fearing that a Vellahla caste judge would side with him. Besides, like you and Sampanthan, none of your brilliant lawyers, including G.G. Ponnambalam and S.J.V. Chelvanayakam, would have had a chance to step in to any of the courts in Prabhakaran’s regime, if they loved their lives. More than that they would have considered it beneath their dignity to step in to kangaroo courts to obey the commands of illiterate factotums serving not justice but tyranny of a fascist school drop-out. You will admit that they, like you, practised in the courts of “the Sinhala State” because the best of Tamil lawyers could find security and justice — not to mention success — only in the courts of “the Sinhala State” and not in Prabhakaran’s Tamil courts. Ponnambalam Jr. went as far as conducting cases in Sinhala in the courts of “the Sinhala State” and not in the Tamil courts of Prabhakaran — his political hero whom he worshipped. Why, Mr. Sumanthiran? Why did Tamil lawyers practise in Sinhala courts and not in Prabhakaran’s Tamil courts, if, as you say, there is no justice? You will, of course, find the odd Sinhala kalu koat karayas talking anam-manan for panam complaining about the lack of Tamil translators in courts. Despite the language disabilities the courts of “the Sinhala State” have dispensed with the justice to all communities to the best of their ability. After all Rome was not built in a day and refinements have been put in place to remedy most of the legal disabilities and impediments. If dignity, equality, justice and self-respect were denied to the average Jaffnaite in the sacred temples of the Hindu God/s which other secular institution could have given the basic dignity to be a human being free from the humiliation of political oppression and social ostracism — the perennial and defining characteristics of the Jaffna political culture in all three phases of its history? Which other community known to you in Sri Lanka, Mr. Sumanthiran, had institutionalised inhuman oppression and denial of the basic human rights to its members other than the Jaffna religio-political culture? If the Jaffnaite felt liberated and respected as a human being wasn’t it when he came out of the casteist gulag of Jaffna to live among the other communities in the open society of the south? Of course, the Vellahla caste elite and later the low-castes who ran Prabhakaran’s regime did enjoy, under their respective political cultures, their brand of justice and dignity which, of course, was anathema to the non-Vellahlas and the non-Prabhakaranists. The inner circles of the ruling elite, like in any fascist regime, enjoyed exclusive privileges that were denied to the rest. The rest were treated like pariahs — one of the Tamil words that entered the pages of the Oxford English dictionary. This confirms that the world outside Jaffna recognised only the worst in your culture. Also, of all the Sri Lankans, it was the Tamils that were designated and condemned as terrorists by the international community. You will now realise that you belong to the most cruel political culture that degraded your own kind to the low level of pariahs, or terrorists. Isn’t your subhuman political culture responsible for making your people pariahs and terrorists? So, considering the fact that your ancestors and political predecessors were the most inhuman offenders of denying justice, dignity, equality and self-respect to your own people Mr. Sumanthiran, what moral right have you or Sampanthan to accuse the GOSL of the crimes you committed against your own people? Your inhuman caste system denied even a drop of water to your fellow Tamils who did not belong to the upper-caste. No Tamil man was denied water, or entry into Kataragama kovils run by Sinhala-Buddhists, or a school in the Sinhala south. You are a good example, Mr. Sumanthiran. You are a post-1956 product from a school run by “the Sinhala State” in the south. Can you tell us the discrimination you faced either because you were a Tamil, or because of the Sinhala Only Act? You are mouthing the anti-Sri Lankan slogans not because you were denied dignity, equality, justice and self-respect at Royal College, Law College or in the “Sinhala State” courts, but only because you can gain some political mileage out of demonizing “the Sinhala State” which has given a status to the Tamils that no State — not even India — has given to the Tamils. You may not know this, or you may not want to recognize it because it is politically disadvantageous to you, but once I point out the facts you cannot deny that the only State under the sun that has given the Tamils the highest status, dignity and respect is what you call “the Sinhala State”. Take the case of the Sri Lankan flag. There are 193 flags flying at the UN and of this the only flag that has given the Tamils a place of dignity, honour, glory and respect in the international community is the Sri Lankan flag. When the President of Sri Lanka, or any other head of state, salutes the Sri Lankan flag they salute all three communities, giving respect, dignity and equality to all communities, just not the Sinhalese. The only stamp in the world that has given Tamil a dignified international recognition is the Sri Lankan stamp. Tamil is also given respect and dignity in the currency notes, in passports, and in Air Lanka — the only international carrier that announces in Tamil. Not even India, which is your original homeland, has given the Tamils the dignity and respect that the “Sinhala State” has given the Sri Lankan Tamils. This is not tokenism. The list is long. But you never stop accusing the Sinhalese about practices that you had imposed on your people without shame or moral concerns. For instance, you raised a hue and a cry about the Sinhala Only Act complaining that it was an attempt to destroy Tamil language and Tamil culture. Fifty six years have passed since then. According to the frenetic fears raised by your predecessors, purely to justify divisive and violent politics, Tamil language should have vanished from the face of the earth under the de-Tamilisation of the “Sinhala State”. Has it happened Mr. Sumanthiran or are you still using it in Parliament and in official dealings more freely than before? More importantly, your leader speaks of a “culture” as if you have the most exquisite and unparalleled culture in the world. Such boasts would be valid only if you have a culture, eh?. Do you honestly think that you have a culture to talk of, Mr. Sumanthiran? According to the claims of Vaddukoddians like Sampanthan and you, the Jaffna Tamils have been in this business of developing Tamil culture and tradition from the year dot — long before the Sinhalese came. So can you kindly show us one single bit of art, architecture, poetry, drama etc., that could match that of the S. Indian culture or the Sinhala-Buddhist culture? Can you show us an Ediriweera Sarachchandra, a Piyadasa Sirisena, a Martin Wickremesinghe, an Amaradeva, a Gunadasa Amerasekera, a Mahagama Sekera, a Sagara Palansuriya, a Lester James Peries, or an Ivan Peiris, to mention only a few drawn from only the 20th century? Of course, I must concede that your Tamil culture surpassed the Sinhala culture and beat the hell out of all communities, including the Jaffna Tamils, when your culture produced two of the great mass murderers in the history of Sri Lanka — Sangkili and your brutal master Prabhakaran. I do bow to the superiority of your political culture which turned men like you and your leader Sampanthan into mice before your great leader. After all he obtained your silence and consent each time he plucked Tamil kids from their parents’ breasts and sent them to an early grave. Is this the culture that you and your leader want to develop under your “unrestricted authority”? When you and your leader talk of a Tamil culture you must do a reality check to see whether it exists outside your limited imagination. The blunt fact, Mr. Sumanthiran, is that you have no culture except the culture that began with the mass murderers, oppressors and torturers of your own people, and ended with the slaughter of your own colleagues under your very eyes which you turned away fearing that you would be the next victim of the brutal Tamil culture that you and your leader boast of so pompously. You have no history except the history written in the blood of your innocent people who were oppressed for centuries by your sanctimonious leaders. You have no religion except the casteist hierarchy that refused to give your people a drink of water, a place in the temple or even the right to bury the dead according to your Hindu rites. You have no art except the art of persecuting and slaughtering your own people. You have no monumental architectural achievements other than the mountainous pile of corpses on which your leaders stood up as self-proclaimed liberators of the helpless Tamil victims sent to a premature, needless death. You have no values except the values of casteist “purity” which denied your people the right to walk in daylight in case they polluted the sight of Vellahlas who might happen to see them. You have no morality except the immorality that denied the dignity for your people to live and walk this earth like any other human being. You have no principles except those that enabled you to justify the ethnic cleansing of Muslims, Malays and Sinhalese. You had no ears to hear the cries of Muslims massacred in Kathankudi when their heads were bowed in prayer. You had no eyes to see the ethnic cleansing of Muslims who were raped and expelled within 24 hours from Jaffna. You had no compassion or conscience to defend your own children being abducted on their way home from school and thrown into a futile war that achieved nothing in the end. Zero! Zilch! If, however, there is anything else in your culture that can make you proud of being a civilized human being please tell us, Mr. Sumanthiran. We would like to know. Can you think of another community that reduced their own people in living memory to subhuman slaves? Weren’t your socio-religious practices worse than that of apartheid in S. Africa or the KKK in the Bible belt of America? You even lack the basic integrity to tell the truth, or face the truth. You have the gumption to get up in parliament and say that “the trust that the minorities reposed in the majority community of this country was broken, and that was broken by the D.S. Senanayake Government. One of the first few pieces of legislation that was passed which disenfranchised over eight hundred thousand Tamils of recent Indian origin, and it took another forty years before they could regain the fundamental right, the basic right of belonging to this country, that of their franchise. That was a great betrayal,” you said. You craftily omitted the vital fact that it was passed with the support of G.G. Ponnambalam, the then sole representative of the Tamils at the time. If G.G. Ponnambalam, the arch Tamil conservative, approved it then why are you blaming “DS”? This is typical. You blame everything on “the Sinhala State” even when the foundations of the nascent nation was built on the advice and consent of your leaders? This is the distorted theme that you and your predecessors have been playing repeatedly to make your mob look pure and put the blame only on what you call “the Sinhala State”. 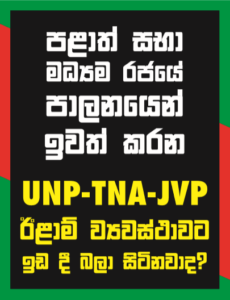 Incidentally, this was also an accusation levelled against the founding father of the UNP. So what was the leader of the UNP, Ranil Wickremesinghe, doing when the founder of his party and Father of the Nation was being vilified by Tamils who worship fascist Prabhakaran and attack democratic liberals like D. S. Senanayake? Not surprisingly Wickremesinghe was playing his usual role of a “pon-air” with “katay-pittu” trying to plant another flag in Sumanthiran’s hand, I guess. D.S. Senanayake did what every leader in the post-colonial world did: he defined the criterion of citizenship, a primary requirement for any state. The colonial masters had left a seething mass of discontented indentured labour and like all legacies of colonialism it was left to the new leaders to define the contours of the new nation. The new nations were not obliged to carry the burdens of British imperialism who plundered the resources and exploited the people. In re-defining the nations citizens “DS” was not unfair or unjust. He offered citizenship to all those applied with qualifications no doubt. The leader of the plantation workers, S. Thondaman, committed the biggest blunder of boycotting the registration of those workers entitled to citizenship. Indian Tamils who could prove that their grandfather lived in Sri Lanka were automatically entitled to be citizens. Thondaman ordered them not to submit their applications until the eleventh hour when it was too late to rush in their applications. So a large number was left out. Eventually, after forty years, as you say, Mr. Sumanthiran, the issue was settled non-violently. How long did your leaders take to recognise your own people as human beings with the right to walk the earth as your equals, or with dignity, Mr. Sumanthiran? In any case, “DS” was proved right when the Indian government later accepted, under Sirima-Shastri pact, a substantial amount of Indian workers as their citizens. Besides, when did the Jaffna Tamils admit the Indian “coolies” as their equals? Wasn’t it the Jaffnaites who spied on “kallathonis” creeping in through northern ports and tipped off the Navy who grabbed them and sent them back to India? Why are you shedding crocodile tears for the Indian “coolies” when your leader, Chelvanayakam, picked up this issue not to better the conditions of the Indian workers but to boost the numerical strength of the isolated politics of Jaffna Tamils? Perhaps, you may not know this, Mr. Sumanthiran. The only thing that Chelvanayakam bought in the south was a tea estate. Can you tell us how he improved the conditions of Indian “coolies” in his estate, if he was that committed to the estate workers? You can see how you shamelessly distort politics and lie through your teeth to put the blame on “the Sinhala State”. All this goes to prove that you and your leaders are a bunch of bankrupt prevaricators who are exploiting the misery of the Tamil people for your survival in competitive electoral politics. Tamil leaders have been the curse of the Tamil people. Not that our Sinhala leaders are any better, particularly the type like Wickremesinghe. But our mob has proved time and again their capacity to maintain a democratic framework — not a five star one though — within which they could solve differences and problems non-violently, except when they were faced with fascist violence from north and the south. Your mob even with “the unrestricted powers” — something which our mob didn’t have — could not run a decent State that gave even a modicum of respect or dignity to the Tamil people, let alone other communities. So when you talk of Tamils not having “dignity, equality, justice and self-respect” in Sri Lanka go and tell that to the blinkered decision-makers and policy-makers in foreign governments, or fanatics like Vaiko, and of course, the marines.